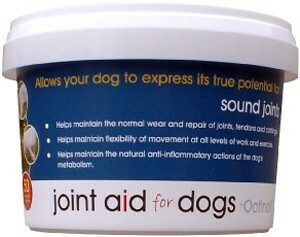 Helps maintain the natural anti-inflammatory actions of the dogs' metabolism. Contains 11 active ingredients, including: chondroitin, collagen, curcumin, glucosamine, glutamine, MSM and vitamin C, plus Oatinol derived: antioxidants, polar lipids, beta glucans and galactolipids. Contains the Oatinol Delivery System to maintain a healthy digestive tract and a high rate of absorption of essential nutricines, vitamins and trace elements. Through the addition of the following specific nutricines, Joint Aid provides a complementary nutritional support for all dogs. Nutricine / Active Ingr. Collagen possesses great tensile strength and provides the body's tissues with their firmness and strength. Referred to as the "glue that holds the body together", it is essential for connecting and supporting the bones, tendons, muscles and cartilage. Glutamine is a protein derived amino acid that supports the natural immune response and is essential for gut wall integrity. MSM (Methylsulfonylmethane) MSM is a source of natural organic sulphur. Sulphur is found in high concentrations in joints and helps to form cross links with other molecules that maintain the strength and integrity of connective tissues.